These two were the first place winners for each category (11 & under and 12 & up) at our Parish's All Saints Costume Contest last night! I'll be back with more pictures soon. We had such a great time! I just found your blog and I absolutely love it! Did you make the costume for your little guy? We recently enrolled our children in a private Catholic school that has an All Saints Day party and they need to dress up as saints. Would you mind sharing which pattern you used? Thanks so much and God Bless! Thank you! I did not make his costume. I purchased the vestments from Our Father's House when my older boys were younger, to go along with their miniature Mass kit. They no longer sell the actual vestments, but they do sell the pattern. The mitre was made by my mother-in-law to go with Rascal's St. Nicholas Costume back in 2006. It has held up pretty well over the years, considering that it was made out of card stock and stapled together! You can find lots of costume ideas in this post Saintly Costumes or you can scroll through my Costume Label for more ideas. I also highly recommend Our Coats of Many Colors. The costumes are somewhat expensive (watch for coupon codes on FB), but well made and last for years. I'd probably spend just as much if I tried making them myself, but I don't really know how to sew. I buy them big and cinch them up at the waist, with the help of a belt, so the kids can continue to wear them as they grow. Congratulations, St. Nicholas! He looks wonderful, and such a happy little saint. Congrats Snuggles! What a great picture. And congrats to Fr. Bill, too! Please say 'hi' to him for me. God bless him, he is just glowing! What a beautiful St Nicholas. Hi, Jessica. I just wanted to thank you for the prayers, our meeting went on and we had a great time. The girls are so excited that they have "princess friends" on the other side of the country. I wanted to just drop you a line before we pack up and leave. Need to get out of these oak woods before this storm hits, too many big trees and we will be stuck on the mountain if we don't leave before it gets bad. I may not have internet for a few days but I will be praying for your family, please pray for mine. This storm is very scary! But God is in control. Hugs to everyone! Your blog makes me so happy! 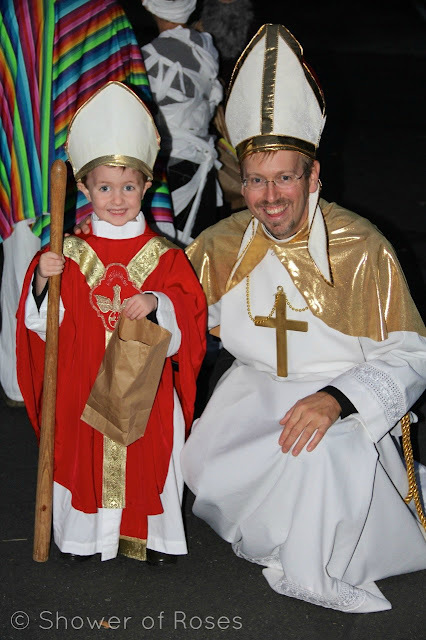 I want to live where the pastor dresses up as Pope John Paul! We're having our annual church saints party Tuesday and we're very excited! I read you blog everyday...thank you for all you do. Hey there. I'm giving you the Super Blog-a-Thon award. So, if you want it, stop by here and pick it up. Yay, and stuff.